Using his passion for history, History Subject Expert Teacher and College Counselor Dr. Hight wants to teach students to appreciate and understand history. He’s preparing his students for college and beyond by giving them, among other skills, the ability to analyze and synthesize information. As a published author, in his elective Narrative Arts, Dr. Hight guides students to produce their own narrative work in the form of their choosing—novel, play, poems, etc. We sat down with Dr. Hight to learn about teaching and advising high school students, his passion for creative writing, and the surprising nature of history! Read his full bio here. It’s hard to know where to start when we sit down with College Counselor and English Subject Expert Teacher Ms. Irving because she has experience with every division at BASIS Independent McLean! She is one of two college counselors here, she teaches English to grade 6 and 8 students, and she has a son attending the school. She loves working with students of many ages and stages. We sat down with Ms. Irving to learn about her passions for Shakespeare, teaching, and helping high school students find their best fit college. Read her full bio here. Walking into Subject Expert Teacher Mr. Joseph’s classroom brings back memories of mathematics and science experiments from the moment we walk in, thanks to the array of numerically themed decorations and projects on his walls. His classroom is clearly a place of wonder and excitement for his students in grades 1–3. We sat down with Mr. Joseph to learn more about him, his teaching style, and the joy of math and science. Read his full bio here. We believe that students deserve the opportunity to dig a little deeper into the sciences. Our students take three hours of Chemistry per week from 6th grade through 8th grade, in addition to Physics and Biology. As high schoolers, they can choose to continue their exploration of this fascinating science in either Honors Chemistry or AP Chemistry. Leading our future chemists is Subject Expert Teacher and founding faculty member, Dr. Blaine Hartman! You can read her faculty biography here. Tell us a little about the exploration camps you led as part of BASIS Independent Summer. I taught two hands-on science camps (grades 1-4 and 5-8) where we conducted labs in biology, chemistry, and engineering. My main goal was for the kids to get excited about science and to have fun. We did a cool lab with Mentos and soda that demonstrated physical change and showed how gas collisions increase under higher pressure. Another activity we did involved learning about the element nitrogen and how liquid nitrogen is made. We then used the liquid nitrogen to freeze flowers, ping pong balls, and slime and to make home made ice cream. We also worked on group-based projects such as building towers and creating hot air balloons. Walking into Mr. Junsay’s music classroom is like walking into a magical theatre. The lights are dim and colored spotlights make the classroom come alive. There is a six foot tall knight in full suit of armor to greet students and the white board is set to the theme of The Wizard of Oz. Keyboards, a drum set, and microphones in the music room allow students to showcase their talents once a month during a mini talent show. Students in preschool through grade 4 attend music with Mr. Junsay once a week for 85 minutes and three times a week in grade 5. Music class with Mr. Junsay is an experience primary school students will always remember. Not only does Mr. Junsay keep his students on their toes, but he also decorates our campus and Great Hall with a theme every month. The theme is always centered on the holiday of the current month or season. This year, Mr. Junsay built a paper waterfall to announce spring and installed a giant wreath to celebrate the December holidays. 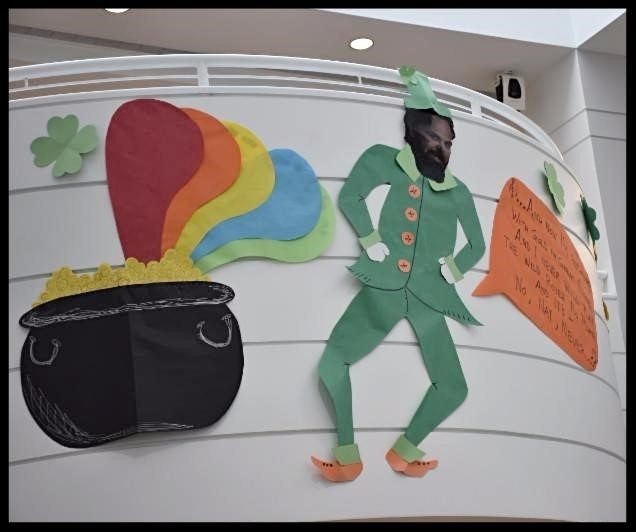 To ring in St. Patrick's Day, Mr. Junsay turned our Head of School into a leprechaun. Mr. Junsay brings much life to our campus and we are lucky to have him as a founding faculty member of BASIS Independent McLean. This week we spoke with Mr. Junsay to learn more about how he makes his classroom come alive.